Paperback, 608 pages, 12.5 x 18.7 cm, 4.9 x 7.4 in. 19th century Cologne: Ariane's skill with needle and thread is indisputable, but her loose tongue has made her impossible and sent all her clients away. Then she meets LouLou. The courtesan is on the verge of setting up in business with her own theatre and needs the adequate clothes for a decent revue! Ariane becomes the dressmaker in the theatre and suddenly her clothes are heavily sought after, also in the upper classes. Everything takes a turn for the better – until an old enemy tries to ruin Ariane and she has to reveal the dark secrets of the past. 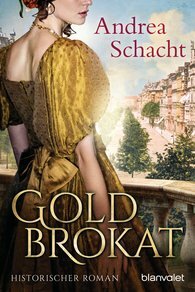 By the master of the historical novel: more than 1.2 million copies of Andrea Schacht's books have been sold by Blanvalet!